Researchers at The Ohio State University Comprehensive Cancer Center have developed nanoparticles that swell and burst when exposed to near-infrared laser light. They are quickly degraded when free in the bloodstream. When ordinary nanoparticles are taken up by cancer cells, the cancer cells often enclose them in small compartments called endosomes, preventing the drug molecules from reaching their target, and degrading them. In this new study, published in the journal Advanced Materials, the researchers packaged nanoparticles with the RNA agent (drug) and ammonium bicarbonate, causing the nanoparticles to swell (as it does in baking bread) three times or more in size when exposed to the heat generated by near-infrared laser light. That causes the endosomes to burst, dispersing the therapeutic RNA drug into the cell. For their study, the researchers used human prostate cancer cells and tumors in an animal model. The nanoparticles were equipped to target cancer-stem-like cells (CSCs), which are cancer cells with properties of stem cells. CSCs often resist therapy and are thought to play an important role in cancer development and recurrence. The therapeutic agent in the nanoparticles was a form of microRNA called miR-34a. The researchers chose this molecule because it can lower the levels of a protein (CD44) that is crucial for CSC survival. Near-infrared light can penetrate tissue to a depth of one centimeter or more, depending on laser-light wavelength and power (see “‘Golden window’ wavelength range for optimal deep-brain near-infrared imaging determined”). For deeper tumors, the light would be delivered using minimally invasive surgery. 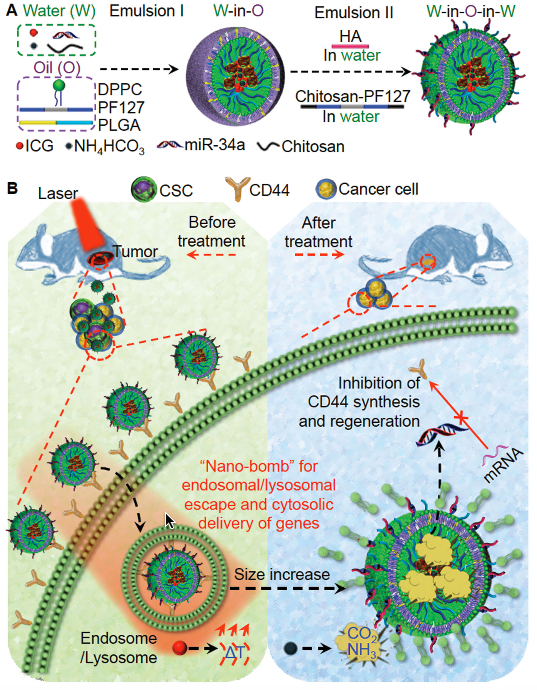 A near-infrared laser-activated “nanobomb” is synthesized using lipid and multiple polymers to break the extra­cellular and intracellular barriers to cytosolic delivery of microRNAs. The nanobomb could be used to effectively destroy tumors and cancer stem-like cells in vitro and in vivo with minimal side effect.